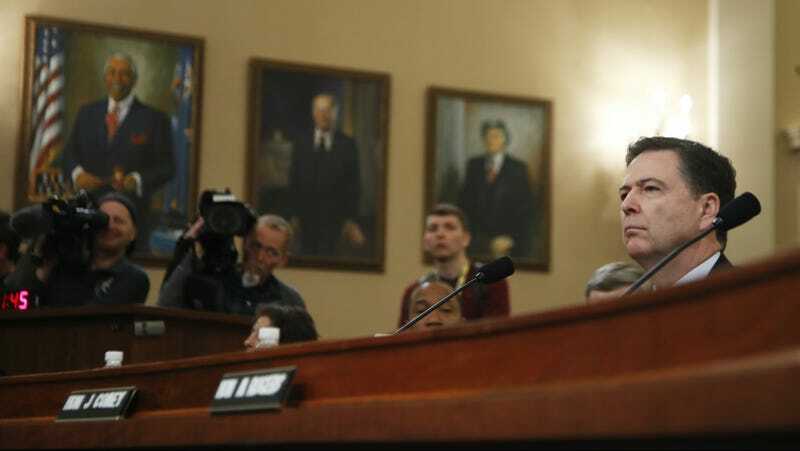 Appearing before the House Select Committee on Intelligence today, FBI director James Comey couldn’t offer a shred of evidence to support Donald Trump’s outlandish and totally unsubstantiated claim that former President Obama wiretapped his phones at Trump Tower during the election. “I have no information that supports those tweets,” said Comey. That’s right, the head of the FBI is currently sitting alongside Michael Rogers, the head of the National Security Agency, to answer questions from members of Congress about Trump’s neurotic tweets. Comey went on to say that there is “no information” that supports Trump’s claim and that “no president could” order a wiretap. “I’ve seen nothing on the NSA side that we engaged in such activity, nor that anyone engaged in such activity,” said Rogers. Literally nobody—including Trump himself, who basically has access to all of the world’s intelligence—has provided even the smallest piece of evidence to prove his wiretapping claim. Hmm... it’s almost as if Trump was lying? For the first time, Comey publicly acknowledged a counterintelligence investigation into Russia’s apparent attempts to influence the 2016 presidential election against Hillary Clinton and in favor of Donald Trump. Furthermore, Comey said the scope of the investigation will include any potential links between Trump campaign staffers and the Russian government. The existence of the investigation has previously been reported, but this is the first time we’ve seen the head of the FBI actually admit it exists. Not only did Trump make a batshit crazy lie about Obama wiretapping his phones, he managed to pull two of America’s closest intelligence allies, Germany and the UK, into the mess. First, he had press lackey and generally angry man Sean Spicer suggest that the British equivalent of the NSA, the GCHQ, were the ones who may have wiretapped Trump. Afterward, the Trump White House had to quickly backpedal to soothe angry GCHQ officials. Then, when German Chancellor Angela Merkel visited the White House, Trump joked that both of them had been wiretapped by Obama, a reference to documents leaked by Edward Snowden that revealed American intelligence had spied on Merkel’s phone. Say what you want about the president, but who else can turn their bad tweets into an international intelligence disaster?